For the SNES version, see Prince of Persia 2: The Shadow and the Flame (SNES). Prince of Persia 2: The Shadow and the Flame is a platform game released by Brøderbund in 1994. Titus Software ported the game to the Super NES and released it in 1996. It has some missing features and lacks several stages, including the last one. On August 11, 2006, the Mega Drive port was leaked. Ported by Microïds, this conversion was going to be published by Psygnosis, as depicted in the leaked version, but it was canceled in an almost complete state for unknown reasons. The game can also be unlocked in the Xbox NTSC version of Prince of Persia: The Sands of Time by finding a secret area. The GameCube, PlayStation 2 and Xbox PAL versions of the game lack Prince of Persia 2, with that secret area unlocking the original Prince of Persia early instead. The PC version lacks the secret entirely. 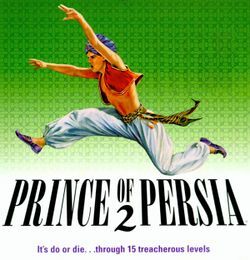 Similar to the first Prince of Persia, the character explores various deadly areas by running, jumping, crawling, avoiding traps, solving puzzles and drinking magic potions. Prince of Persia 2 is, however, more combat-heavy than its predecessor. The game takes place eleven days after the events of Prince of Persia, in Persia, as well as various other locations. During this period of eleven days, the Prince was hailed as a hero who defeated the evil Jaffar. He turns down all riches and instead asks for the Princess' hand in marriage as his reward, to which the Sultan of Persia reluctantly agrees. This page was last edited on 5 December 2016, at 09:03.